The Connecticut lease agreements are legal contracts written between an owner (or their selected ‘Agent’) and an individual (the ‘Tenant’). The tenant agrees to use the premises, either for residential or commercial purposes, for an agreed-upon length of time in return for payment to the landlord. All residential agreements must follow Chapter 830 – Rights and Responsibilities of Landlord and Tenant. Rental Application – If a landlord/agent is unaware of the background and employment of a tenant and would like to verify they may do so with this document. Association of Realtors Residential Lease Agreement – From the Northern Fairfield County Association of Realtors but may be used State-wide between a landlord and tenant. Commercial Lease Agreement – For any business related use such as office, retail (store, restaurant, etc. ), or industrial type of space. Lease to Own (Option to Purchase) Agreement – Period of time allowed for the lessee to purchase the property at a pre-determined amount states in the contract. If the option is not used by the tenant the form works as a standard lease. Month to Month Rental Agreement – Known as a “tenancy at will” with no end date in the contract, rather it is terminated via notice through a lease termination letter. Roommate (Room Rental) Agreement – For parties living in a shared housing arrangement. Standard Lease Agreement – The standard template for an arrangement between a landlord and tenant for the use of residential property. SubLease Agreement – Allows the tenant of a property to accept a subtenant to take their place. Original lessee remains responsible until the end of the term. 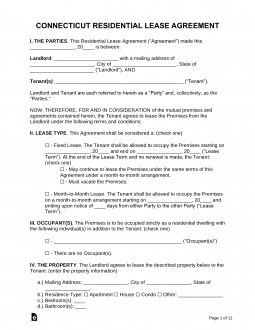 Termination Letter – Use if the landlord or tenant decides to cancel their rental agreement. Common Interest Community (§ 47a-3e) – If the residence located in a common-interest community this disclosure must be attached. Landlord Identity (§ 47a-6) – The Owner/Agent is required to identify themselves in the form and list where the tenant may send notice. Landlord-Tenant Guide – The Rights and Responsibilities Guide should be given to every tenant in order for them to be aware of any and all State laws. Lead-Based Paint – According to federal law all buildings built prior to 1978 must have any new tenants fit with this disclosure stating that there could be the presence of lead-based paint in the residence. Access (§ 47a-16) – Landlord must give tenant reasonable notice to enter the premises for any repair, inspection, or need for the Owner/Agent to show the property. Maximum (§ 47a-21) – Landlord may request up to the equivalent amount of two (2) months’ rent from individuals under the age of sixty-two (62) years old. Although, individuals sixty-two (62) years and older may only be charged up to one (1) month’s rent. Returning (§ 47a-21) – Tenant is due their deposit back, along with any accrued interest, within thirty (30) of handing the premises back to the landlord or within fifteen (15) days of receiving the tenant’s forwarding address, whichever is later.